Oleksandr Muzychko, a leader of the Right Sector fascist paramilitary group that led street fighting against riot police during last month’s Western-backed putsch in Kiev, was shot and killed in the western Ukrainian city of Rivne late Monday. The Ukrainian Interior Ministry confirmed that he was killed in a police operation, underscoring continuing tensions inside the far-right Western-backed regime in Kiev. Ukrainian opposition legislator Oleksandr Doniy claimed, however, that Muzychko died in a gangland-style killing by assailants who stopped his car, tied his hands behind his back, and shot him. Former senior Ukrainian intelligence officials speaking to Russian news agency RIA Novosti said that the killing of Muzychko was an operation carried out under the direct orders of Ukrainian intelligence chief Valentin Nalivaichenko. “The goal of the operation was not to capture, but to neutralize Muzychko, to take him off stage,” they said. “We will avenge ourselves on [Interior Minister] Arsen Avakov for the death of our brother. 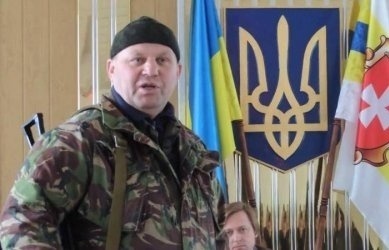 The shooting of Sashko Bily [Muzychko’s nom de guerre] is a contract killing ordered by the minister,” said Roman Koval, a Right Sector fighter in Rivne. After the putsch, he was filmed slapping Ukrainian prosecutors and threatening Ukrainian legislators with an assault rifle. He also repeatedly threatened officials in Rivne. He was put on the Ukrainian police’s wanted list after these incidents, on March 12. At the time of his death, Muzychko was also under investigation for involvement in Ukrainian organized crime. He also faced an international arrest warrant, for torturing Russian prisoners while fighting on the side of Islamist Chechen separatists against Russia in 1994-95.